the life energy back into me...and renewed my spirit!" Dr.Kun Xiang, O. M. D., L.Ac. 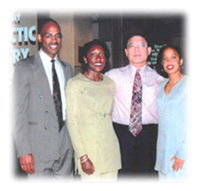 Olympic Gold Medalist Chryste Gaines with Dr. Xiang and fellow athletes John Johnson and Robin Johnson. Dr. Xiang earned his medical doctoral degree at Shanghai Medical University in China in 1982, learning a combination of ancient Chinese healing arts and modern medicine, after being selected as a promising student and chosen among thousands to attend school. He graduated at the top of his class, focusing on preventative and restorative Chinese medicine and acupuncture. He is a member of the Council of Acupuncture and Oriental Medicine, and often returns to China to learn about the latest developments in acupuncture, as well as to manufacture a few items that he has personally designed (e.g., cushions, braces) and hand-select a few other special products to bring back to America. Dr. Xiang will listen to you, ask you questions about your health history and any current issues, and analyze your body to determine the best combination of acupuncture treatments, powdered herbal healing concoctions, and lifestyle adjustments that will help you achieve optimal results. Although he can treat any number of concerns, he specializes in relieving pain, healing soft tissue injuries, and increasing fertility.